Back in the 80’s, British band Magnum were one of my favourite bands. Even though I have heard about the band before, I never really had any interest in them until back in 1985 when a class mate, who were not into hard rock and metal at all, told me to listen to this great album he had in his Sony Walkman (yes, that’s a cassette for ya, kids). It took only one song for me to get totally floored. The song was called “How Far Jerusalem” and the album was called On A Storyteller’s Night. I didn’t listen to any more songs right then, but on my way home from school, I stopped by the local record store and bought said album and I have been a fan ever since. The follow up’s Vigilante (1986) and Wings Of Heaven (1988) put Magnum on the map as a major rock act. At least in Europe. USA was still cold to the band and they were literally unknown over there. Of course, we couldn’t have that, now could we? Both band, managers and record company started to draw a sketch of how to break them over there. Of course, again, everything went down the drain. To try to get a very European sounding band a more American sound with co-writers like Jim Vallance and a “hit” producer like Keith Olsen wasn’t exactly a stroke of genius. Not only did the album, Goodnight L.A. (1990), bomb big time in the States, the move also made them lose a lot of their European fans as well and since then things have never been the same. The albums Sleepwalking (1992) and Rock Art (1994) were both uneven (Sleepwalking must be one of Magnum’s most dull albums ever) and didn’t do much to gain any popularity and the band split after that. By then, grunge had put its claws into the busic biz which didn’t exactly better things. Bob Catley (lead vocals) and Tony Clarkin (guitar, song writer) tried to start over in Hard Rain, but no one really cared about that project. Bob Catley started a solo career back then, a solo career he has in parallel with his day job in Magnum to this day. But of course there was no way in Hell that Magnum could continue to not be a band. In 2002 they reunited and released Breath Of Life and Brand New Morning (2004), two good, but not astonishing albums. But what they did do was to show everybody that Magnum were back and that this time they were writing songs for themselves and no one else. And thing would be better – lots better. Princess And The Broken Arrow (2007) and Into The Valley Of The Moonking (2009) didn’t only bring them back sound wise, the songs were all written like classic Magnum tracks and they were bloody good as well. Even the artwork was back to basics. And since then, Magnum has never looked back and today they are just as productive as in their heyday. Their two latest efforts, The Visitation (2011) and On The 13th Day (2012) proved that the other albums weren’t just two lucky strikes. Which means that Magnum has a lot to live up to – not only their great past, but also the fact they keep on releasing great albums to this day. And just as thought, there’s no need to be apprehensive as opener “Live ’til You Die” is just fabulous, a rhythmic song with all the classic Magnum attributes, not far away from Princess Alice brilliant opener “When We Were Younger”. “Universal Sacrifice” is just awesome – a pompous, uptempo rocker with strings all over it, “Falling For The Big Plan” is a real killer – a fat rocker all done the Magnum way, “Crying In The Rain” is a riff happy, Led Zeppelin influenced rocker, Magnum meets Zep – very cool, and “Too Many Clowns” is a rock ‘n’ roll song and a bit different to the usual Magnum stuff. The song has gotten some criticism from fans all around, but I dig the song. In the fantastic “Midnight Angel”, Clarkin has written a “Les Morts Dansant” (On A Storyteller’s Night) for the 21st century. Maybe the best track on the whole album. “The Art Of Compromise” glistens with nostalgia in a good way as the song has a big Chase The Dragon (1982) feel. With the ballad “Don’t Fall Asleep” they album dips a bit. It’s not bad at all, but they can do so much better. But with “Valley Of Tears” , we get our grand ballad. It’s a big, classic Magnum ballad, just the way we love them. Once again we can state that Magnum has released another brilliant album and by now, Magnum has turned into a reliable bunch, much like they were in the 80’s. With this album, Magnum has recorded their best album since the reunion – I would even go as far as to stress that this is their best effort since the magnificent Wings Of Heaven and the sound comes across as a fine mix of Chase The Dragon and On A Storyteller’s Night, with a little more rockier moments. On the downside, I kinda miss those big, epic monumental songs like “Don’t Wake The Lion”. It’s been a while since we saw any of those. Also, Bob Catley is still a great singer, but on this record he sounds, for the first time, a little strained here and there, but other than that, no complaints from this guy. 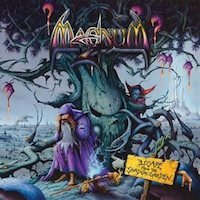 If you’re a Magnum fan, then getting a copy of this album should be a no-brainer and for the rest of you who hasn’t made acquaintance with the band yet – well, it should really be a no-brainer for you as well. I’m constantly amazed at the depth of rock music; how there can be bands like Magnum that I hadn’t even heard of until I was well into my 30’s. So yeah, from the Canadian perspective, Magnum didn’t break here, and even Jim Vallance (being Canadian) had zero impact. They probably didn’t record in Canada. If they had, it could have made all the difference. We have this thing called “CanCon”. With a Canadian co-writer, if they had recorded on Canadian soil or even used a Canadian producer, that would have qualified Goodnight L.A. as CanCon. Meaning they would get pushed on the radio here. Well, no they never recorded in Canada and I’m not even sure if they even toured there. About the Goodnight L.A. album, it’s named after the studio with the same name. If I’m not totally misinformed, that studio belonged to Keith Olsen. Or maybe it was the studio where he worked at. So you might the idea where Magnum recorded that album. Glad to see Magnum have fans over the pond!They are doing a co-headline tour with a band called Saga on the german leg of the shadow garden tour.I think they are canadian? Ive been a fan since the Vigilante album.Theres something magical about this band.I cant think of any other band who have been going this long and still producing such high quality albums.Tony Clarkin really is something special. Saga are indeed Canadian. In fact their ex-drummer Brian Doerner lives not too far from my place. Brian Doerner? Is he related to Helix-Brent?